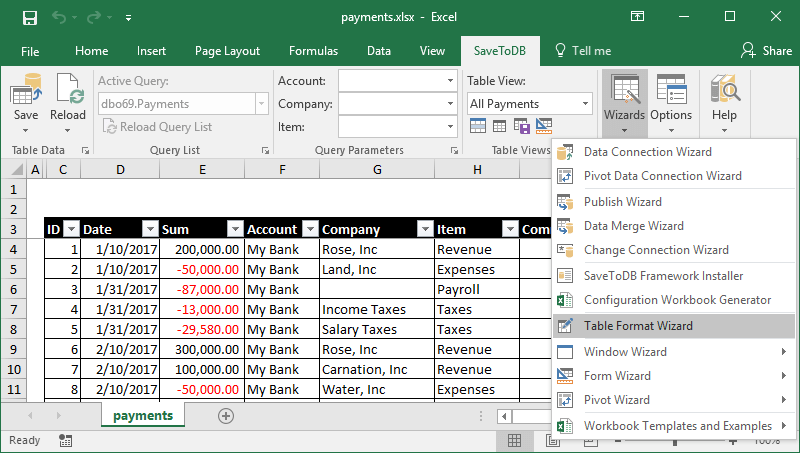 This e-book shows how to create feature-rich multi-user Excel applications with no SQL or VBA use. You may repeat the steps and create a lot of applications for your team yourself. Microsoft Excel is an amazing product. It brings freedom to business users as allows getting data from anywhere and consume the data in any way. 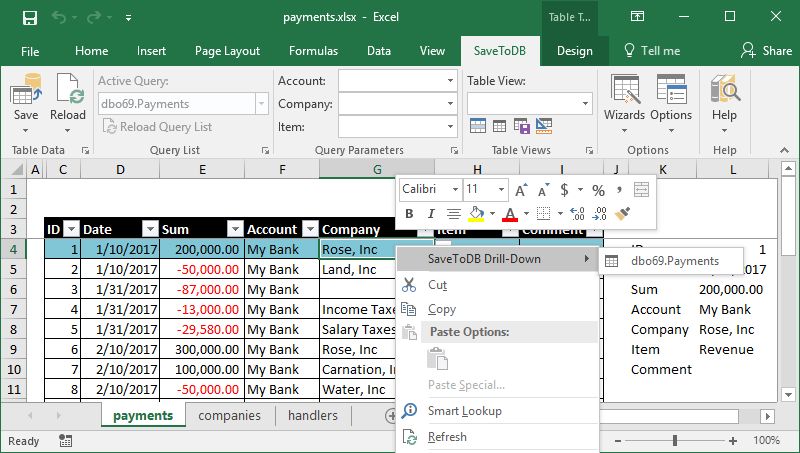 If you like Microsoft Excel, you definitely have to try the SaveToDB add-in for Microsoft Excel. The add-in allows database and VBA professionals to create complex corporate applications using Excel. 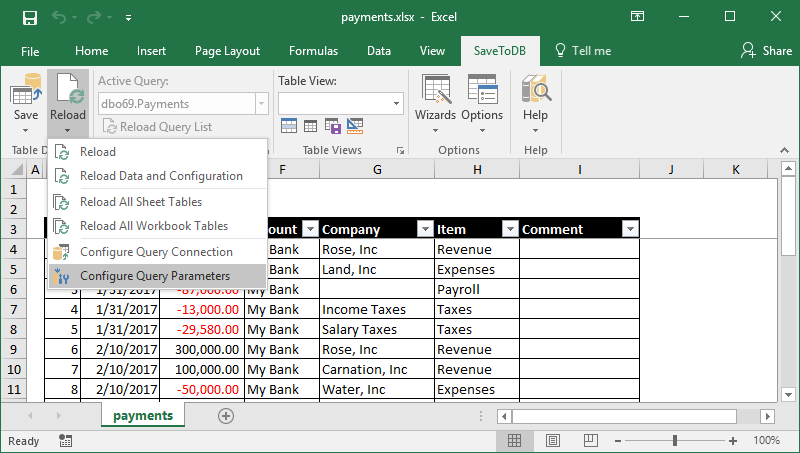 Moreover, the add-in allows business users to create Excel applications with no SQL or VBA use. You have to download and install the SaveToDB add-in at www.savetodb.com, version 7.2 or higher. You may also use Oracle Database, IBM DB2, MySQL, and other supported databases. The steps remain the same. Suppose, we have a team that uses this workbook: Alex as a leader, Nick, and Lora. In common case, such workbooks are located in shared folders or corporate portals. Simultaneous editing of such workbooks is not easy. Also, every user periodically wants to add personal worksheets or formulas and do not share them with others. We will solve all these issues placing data tables to a database. Moreover, you may do this yourself. 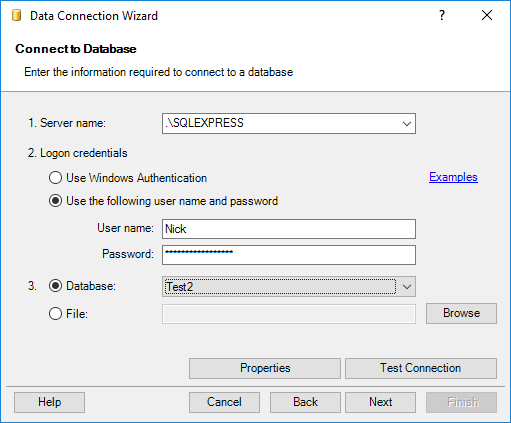 SQL or VBA knowledge is not required. Our application requires a database. 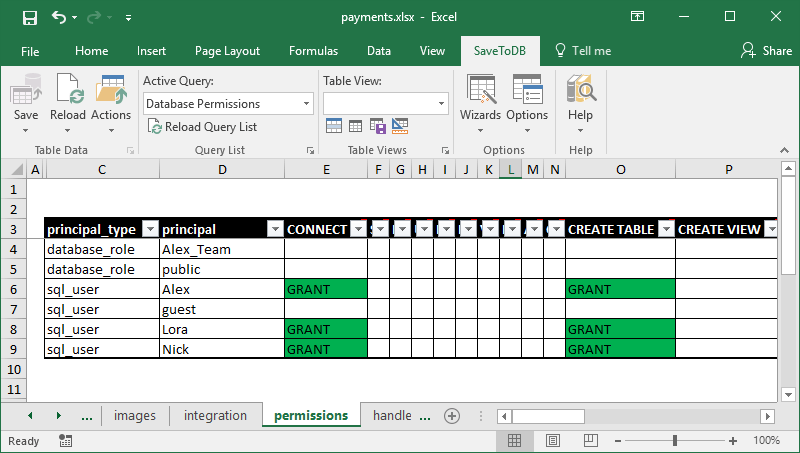 Also, you must have enough permissions to create and edit tables. I need a schema in a database. My team will create tables in this schema. I want to manage permissions on our tables. My team members: Nick, Lora, and I am, Alex. 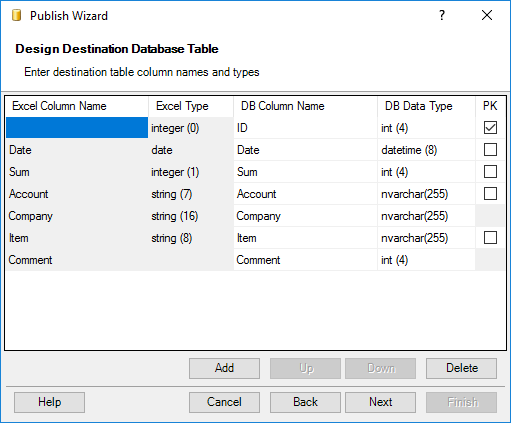 Create two tables, EventHandlers and TableFormats, using the attached SQL codes. It is an easy task for your IT staff. Just send this chapter to him or her. Further, we will use the dbo69 schema in the Test2 database and user names like Alex, Nick, and Lora. You may skip the comments below and continue to the next chapter. 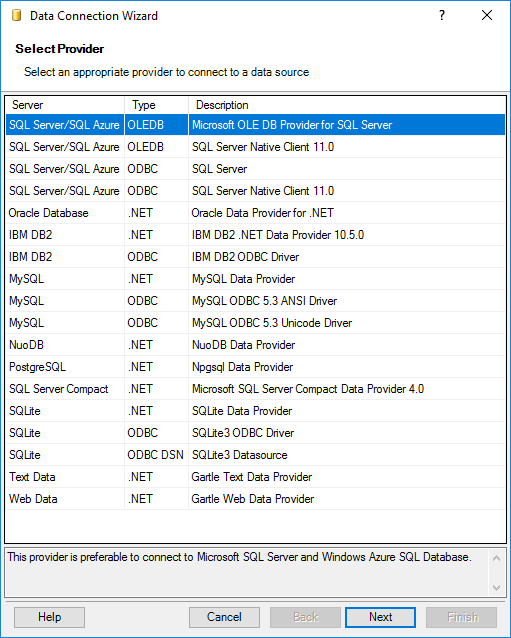 The following two tables stores the SaveToDB add-in configuration. You must have these tables in a database to implement certain of features. In this chapter, we will publish our table to a database. 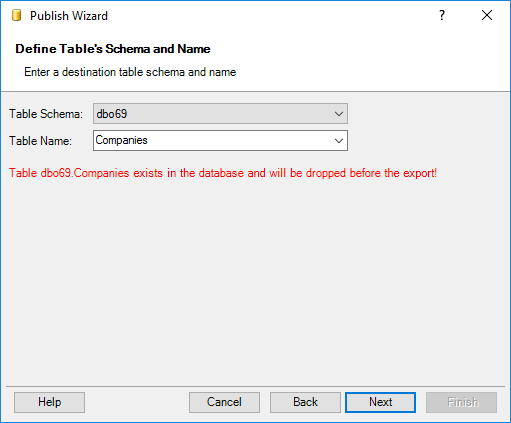 This action is required once for every table that you want to have in a database. 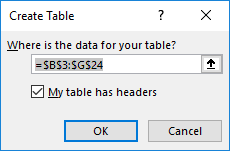 The tables must be an "Excel tables", not regular ranges. 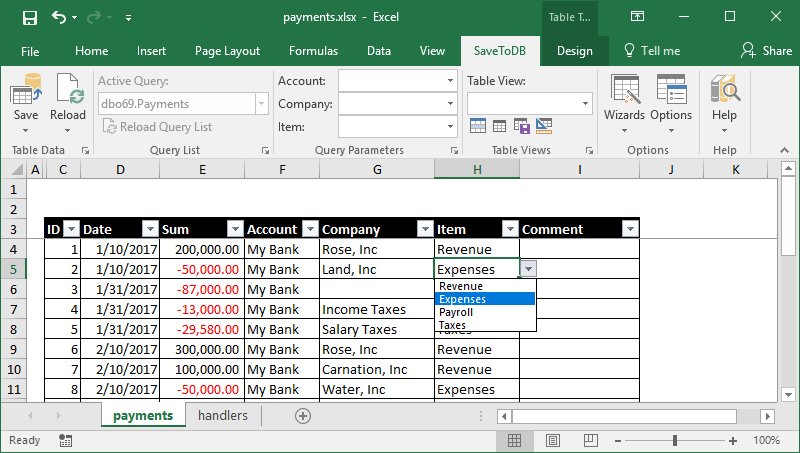 To convert a range table to an Excel table, select a cell in a table, and click Insert, Table. Excel suggests an entire region. Correct it if needed. 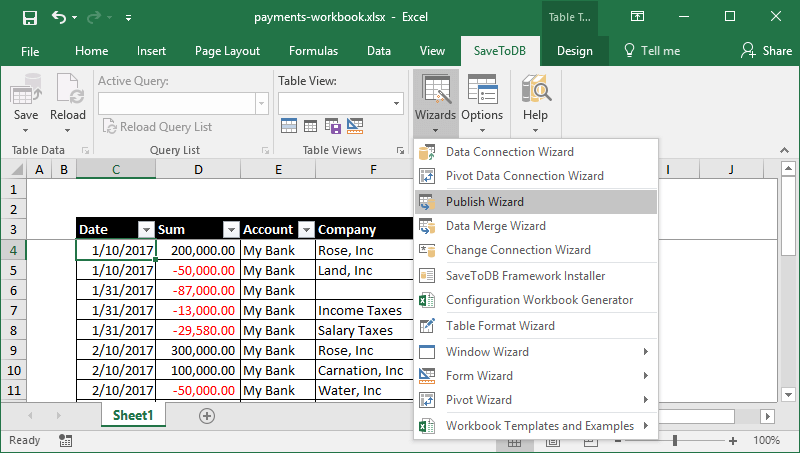 Check My table has headers and click OK.
Now select a cell in the table and run Publish Wizard. 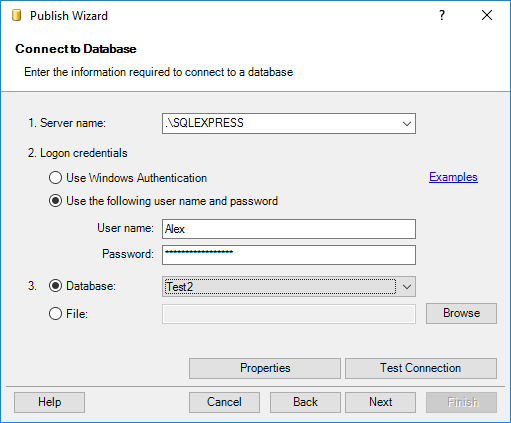 You may publish tables to any supported database like SQL Server, Oracle, MySQL, and others. 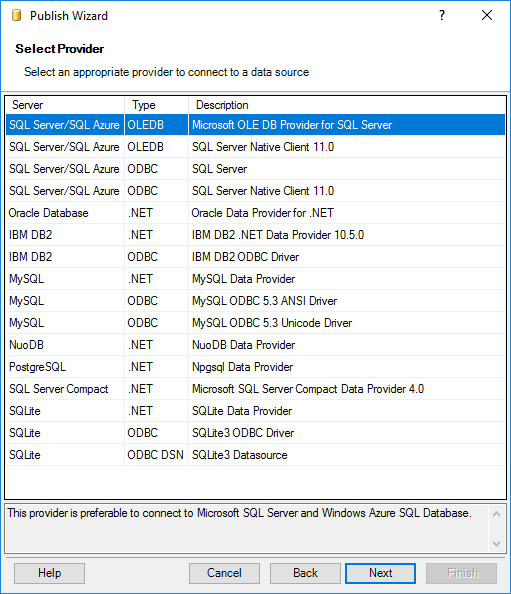 Select the first provider for SQL Server. In the next step, you have to specify a server, a database, and logon credentials received from your IT guy. 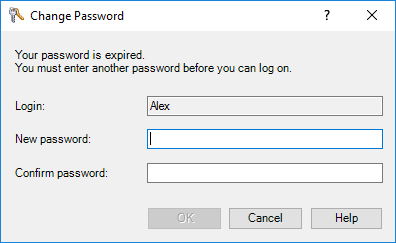 Fill the new password twice and click OK.
Then click Next in the connection form. 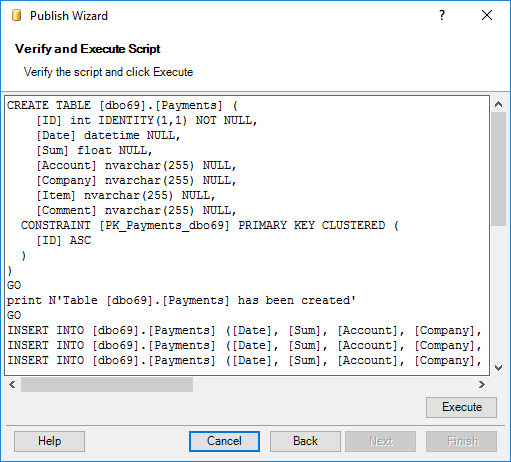 The add-in suggests a database table structure based on actual data in the published table. In this example, we need to change the int type of the Sum column to float, and the int type of the Comment column to nvarchar(255) as shown on the next page. 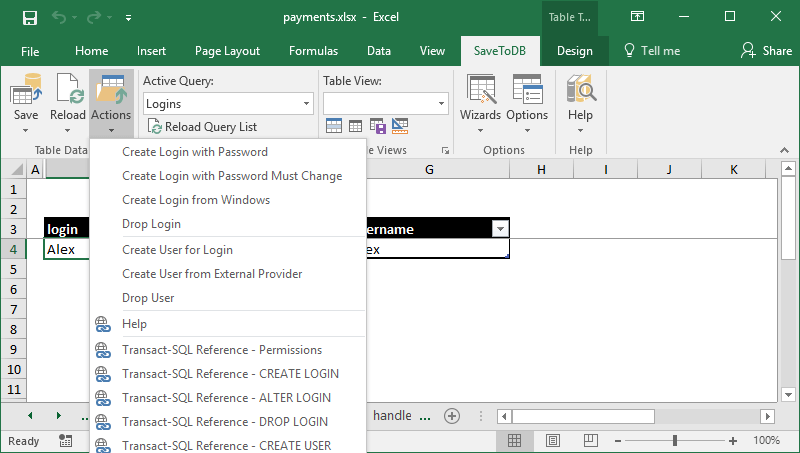 The add-in suggests the correct types for target databases and actual column types in the drop-down list. 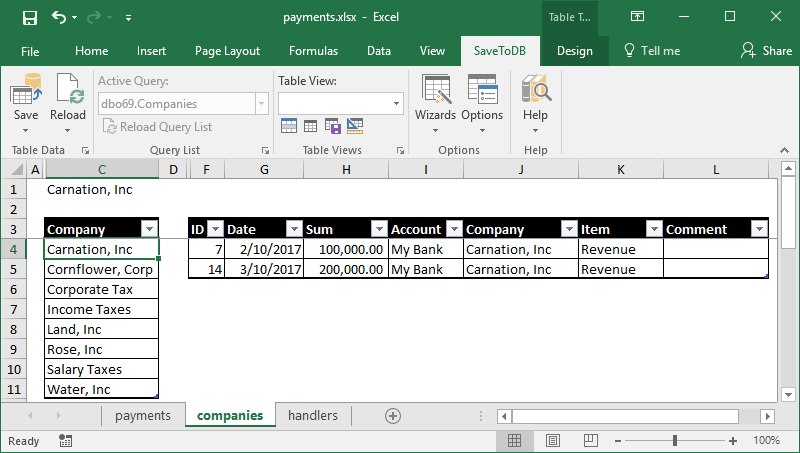 Also, tables must have the primary key column or columns that uniquely identify table rows. In most cases, you may add a column like ID of the integer type. 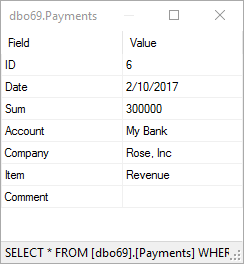 The add-in does this automatically if it does not find a column with unique values. You may define primary key columns checking the PK column. Also, you may add, delete, rename, and reorder columns. It is a good idea to have column names without spaces. 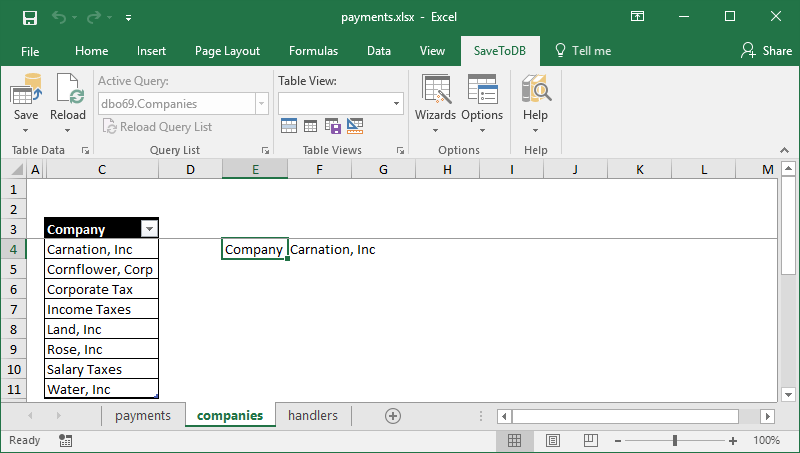 You may use capitalized word parts like CompanyName. You may edit the script if you need. For example, you may delete INSERT rows if you need to create an empty table. Also, you may create multiple tables changing table names only. 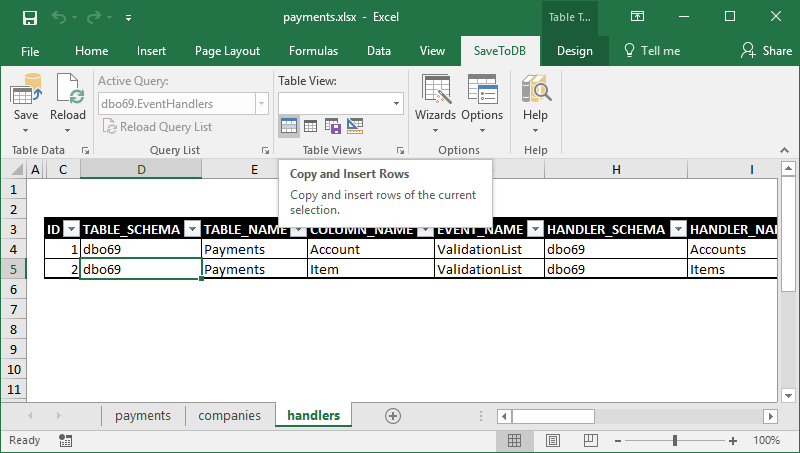 You may change column data types if you do not find it in the drop-down list in the previous step. Click Execute when you are ready. The add-in shows execution results on the next screen. You may repeat steps if you need. Just click Back. 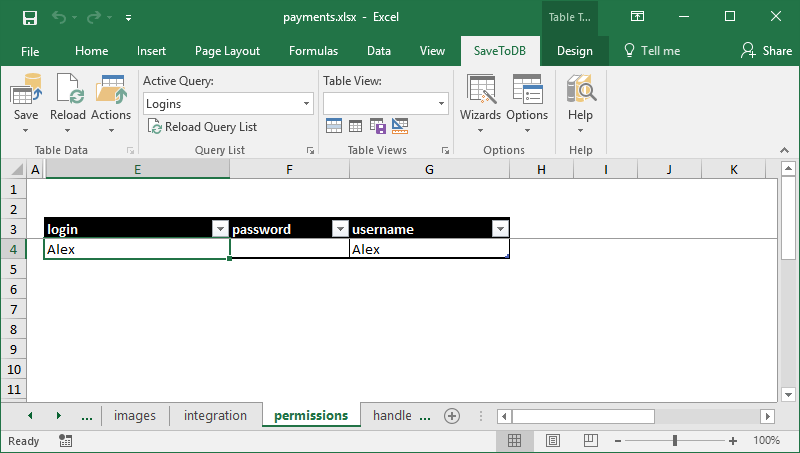 You may click Cancel if you do not need to insert a new connected table into the workbook. First of all, you see that the Save button is enabled. 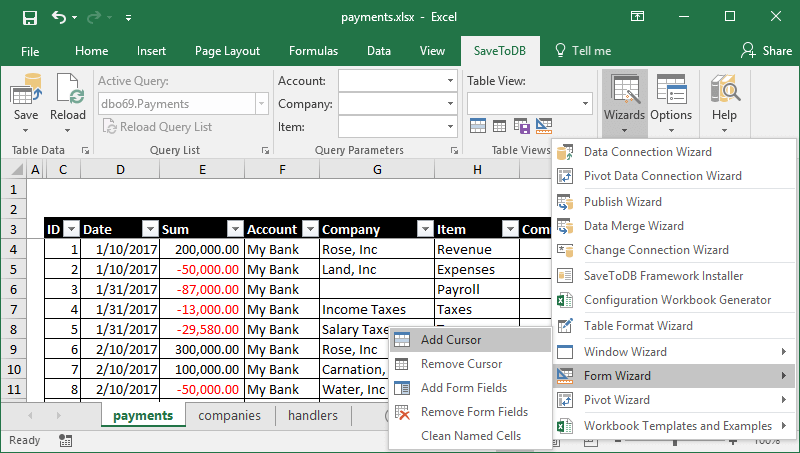 You may change data, add and delete rows. 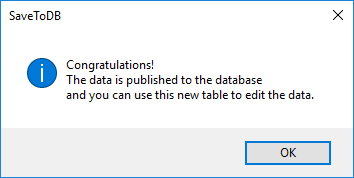 When you are ready to save changes to a database, just click Save. If you do not want to save changes, just click the Reload button. Note that you may use the Undo command (Ctrl-Z). The add-in does not disable it, unlike macros. 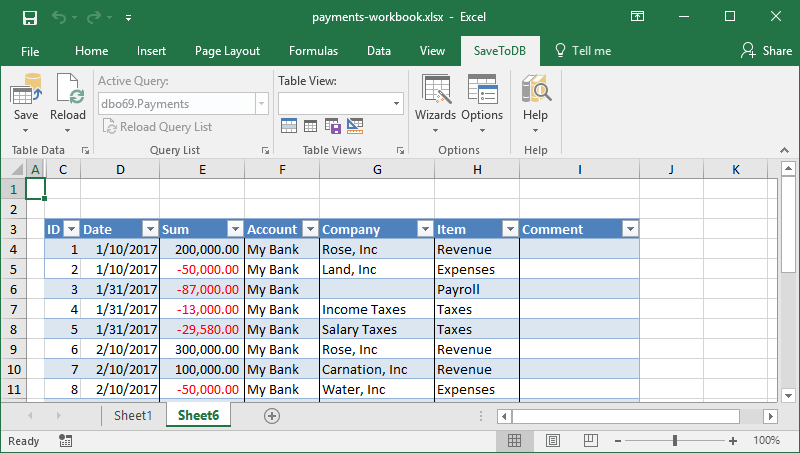 You may save and close the workbook, and then open it and save the data changes to a database later. This is useful when you work outside of the corporate network. 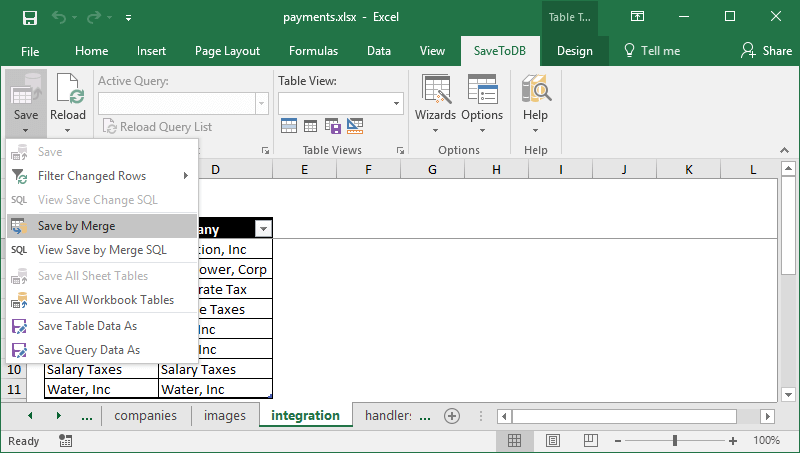 You see that the add-in inserts a new table on a new worksheet named as Sheet6. You should know that the add-in creates "very hidden" worksheets that contain configuration data. You may unhide the add-in sheets using SaveToDB Options, Developer Options, Show SaveToDB Data Sheets. 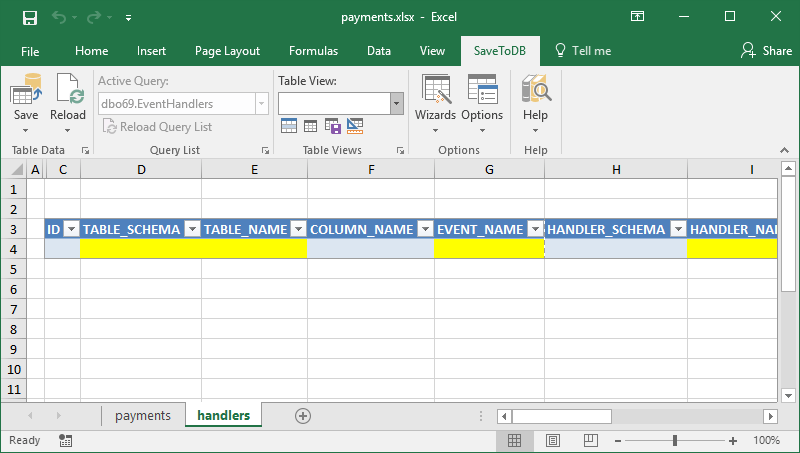 You may see the connected table name in the Active Query field. 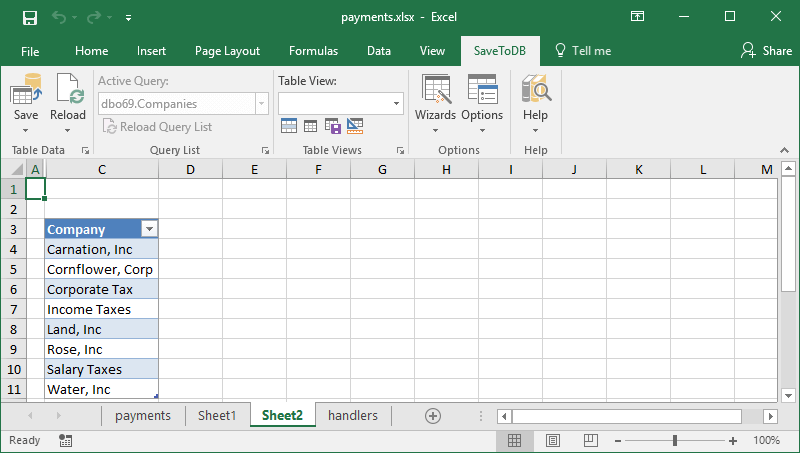 In our example, let&apos;s do the following: rename the Sheet6 to payments, remove the source Sheet1, format the table, and save the workbook as a new workbook as payments.xlsx. 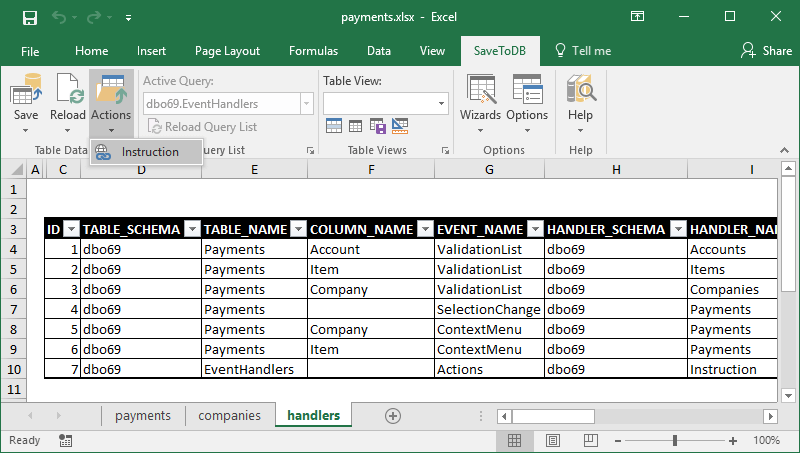 As a result, we have a new workbook with a table connected to a database. 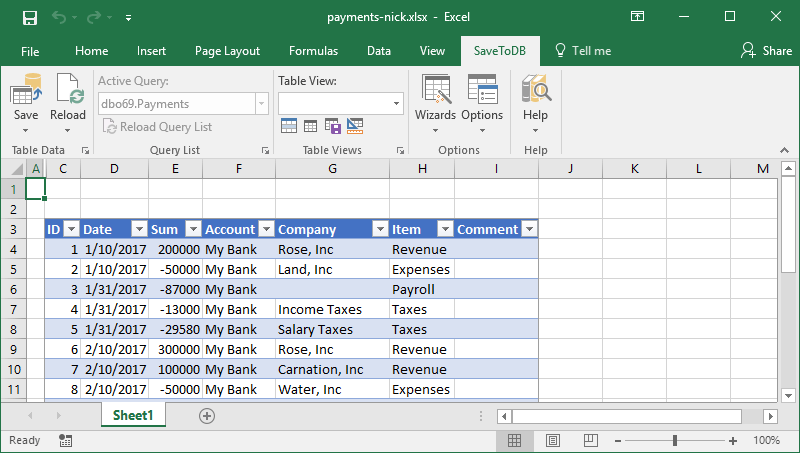 In this chapter, we connect to the created Payments table from a new workbook under Nick&apos;s credentials. Let&apos;s create a new workbook and save it as payments-nick.xlsx. Then let&apos;s run the Data Connect Wizard. The wizard contains the same connection steps as described above. 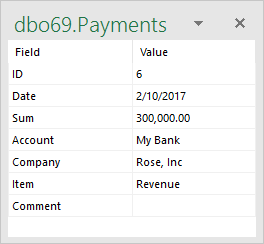 Let&apos;s connect to the dbo69.Payments table. You may use search. 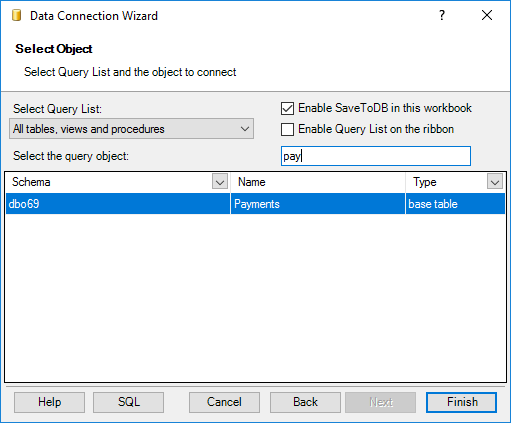 Uncheck Enable Query List on the ribbon. In this step, you may check the fields to select and the fields to use as filters. We will learn this in the next chapter. Now you may click OK and insert the table at cell B3. We have an editable table in Nick&apos;s workbook. Alex and Nick can work now in their personal workbooks. The table has an ugly format, unlike Alex&apos;s table. We will solve this in Chapter 7. Users often apply different filters to the loaded data, hide and unhide columns, sort in various ways, etc. You may use the auto-filter row and table views for any Excel table. 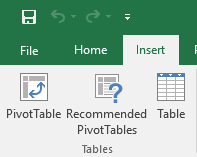 Moreover, you may save views for pivot tables also. I am sure you will like these features. 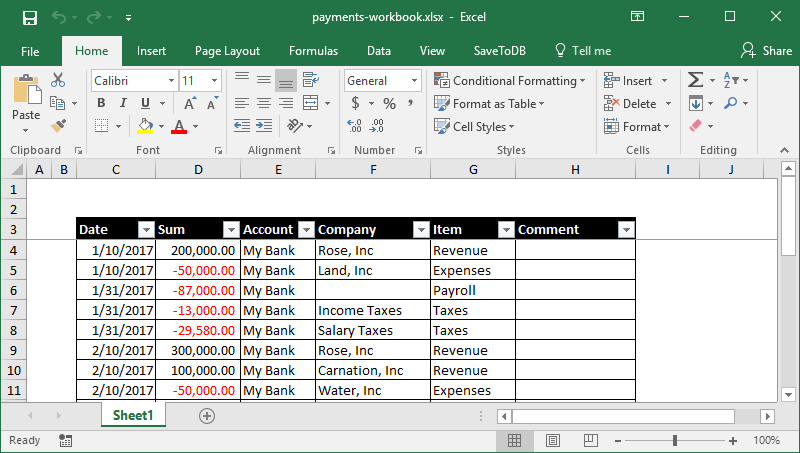 We have formatted the table in the previous steps in the payments.xlsx workbook. 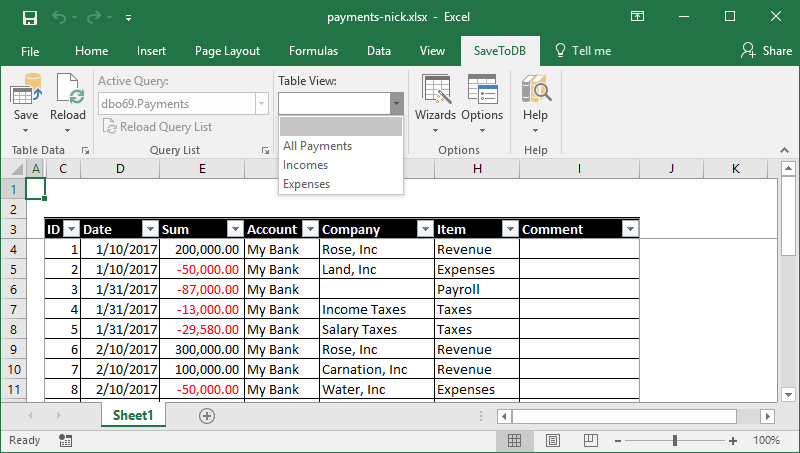 If a user connects to a database from a new workbook like Nick in Chapter 4, he has Excel defaults. We can fix this publishing table formats and table views to a database using Table Format Wizard. Users may use the Restore from Database button to reload the updated formats and views. 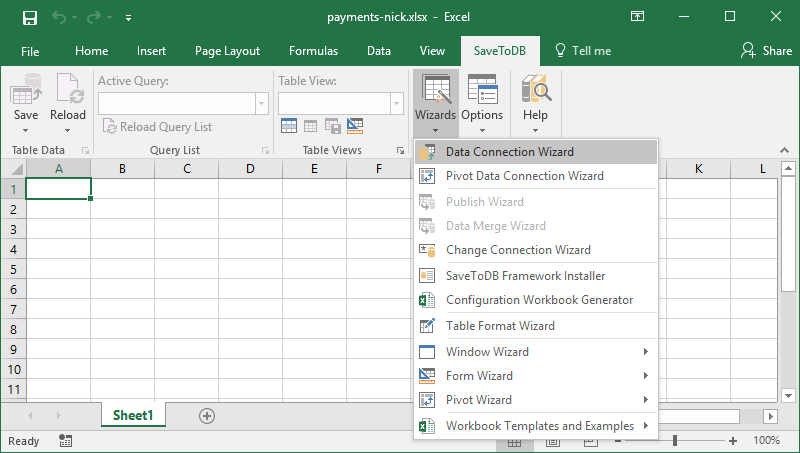 For example, let&apos;s switch to Nick&apos;s workbook and run Table Format Wizard. 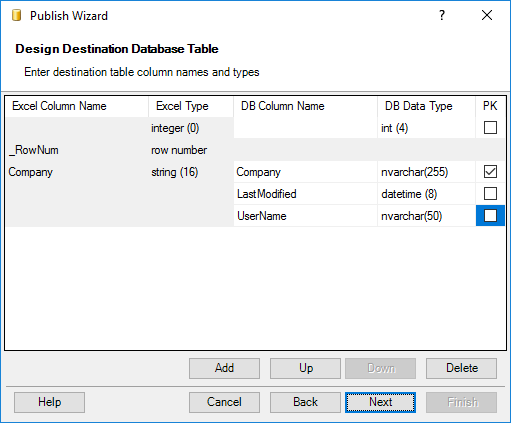 Select the desired table and click the Restore from Database button. Then close the wizard. Once again, you may use this wizard to save and restore formats, formulas, and table views. This feature allows sharing best features when every team member uses personal workbooks. 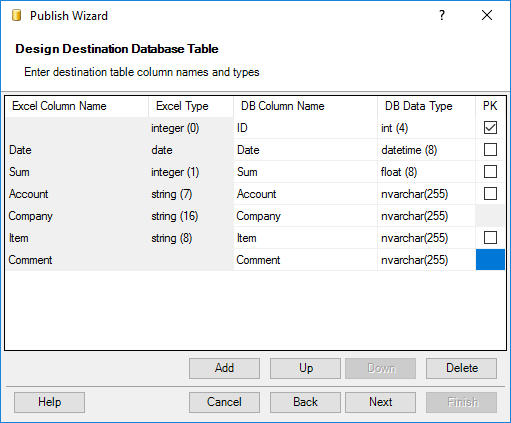 The Table Format Wizard saves formats in the TableFormats table in a database. 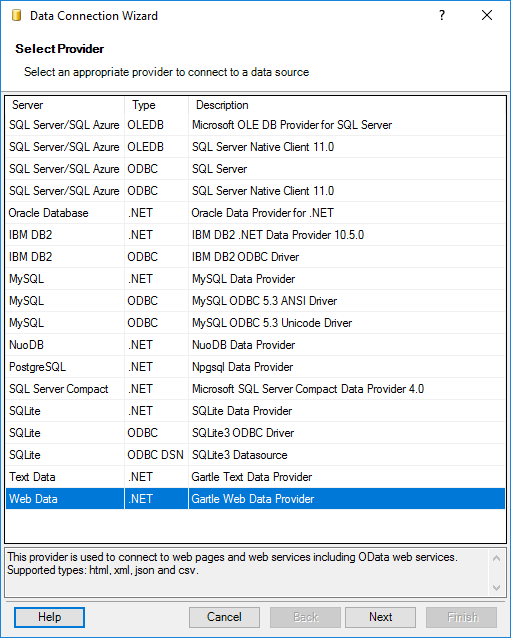 We have created this table using the SQL code provided in the Configuring Database chapter. 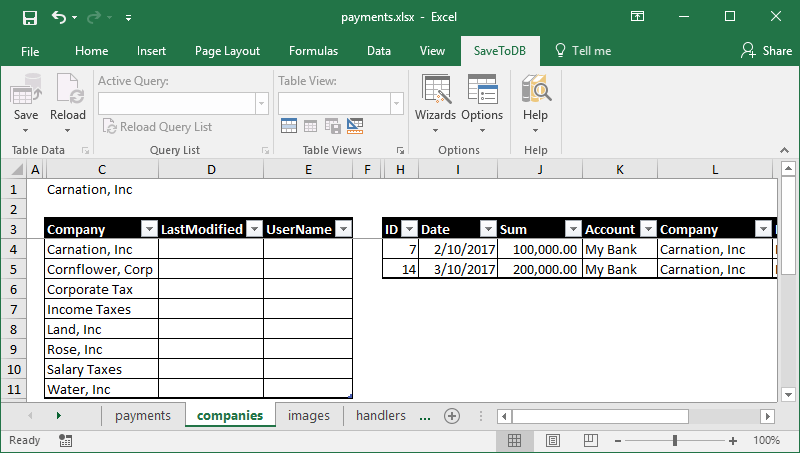 In this chapter, we will create validation lists for Account, Company, and Item columns. Moreover, we will configure this feature in a database, and the add-in will apply validation rules automatically. 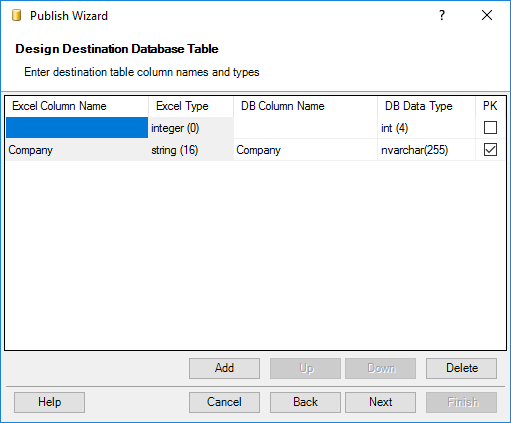 Configuring validation lists requires the EventHandlers table in a database. 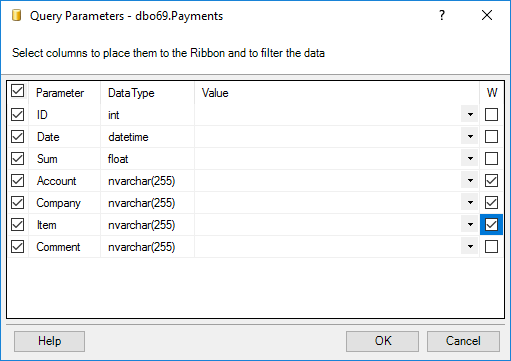 Uncheck Enable Query List on the ribbon. Click Finish, and insert the table at cell B3. The add-in highlights fields that require values. Let&apos;s format the worksheet and table to make them beautiful. In the table part, we have specified the configured table, its columns and the event name as ValidationList. In the handler part, we have defined how to handle events. In this case, we have configured the VALUES type and specified static values in the HANDLER_CODE field. 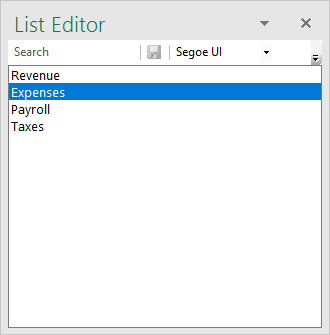 The add-in activates List Editor that allows selecting values from lists in a comfortable way, including search. 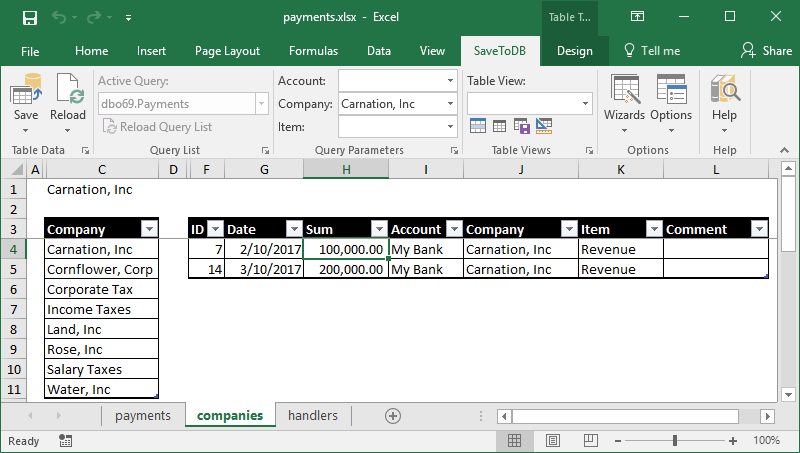 Let&apos;s create a validation list for the Company column. We must have the possibility to change values easily. The table contains one column that is used as a primary key column. It&apos;s ok. Click Next and execute next steps. 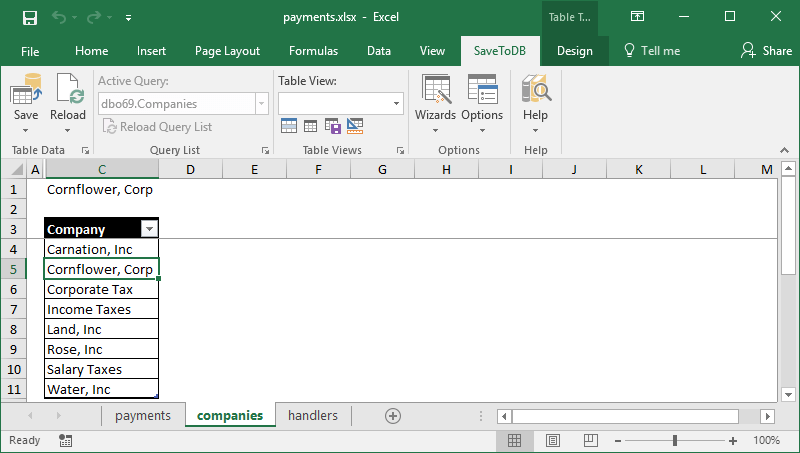 Publish table as dbo69.Companies table. 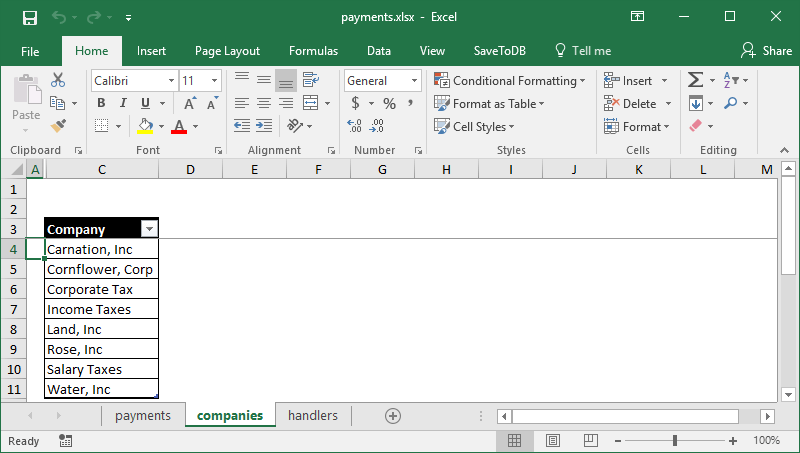 Switch to the handlers sheet, select a cell in row 5, and click the Copy and Insert Rows button. This action will create a copy of the selected line. So, you may easily change only different values. 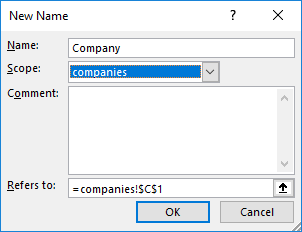 As a result, the add-in will create a validation list for the Company column using the Company field of the dbo69.Companies table. 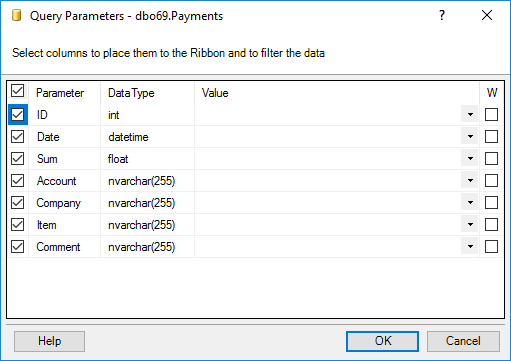 You have to know that the add-in places connected tables of validation list source values like dbo69.Companies to a hidden worksheet and configures validation lists using a range formulas. Setting validation lists this way has great benefits. You configure it in the EventHandlers table, and the add-in creates validation lists automatically. Just use Reload, Reload Data and Configuration to reload validation list values. The add-in inserts form fields and updates them when you select another row. 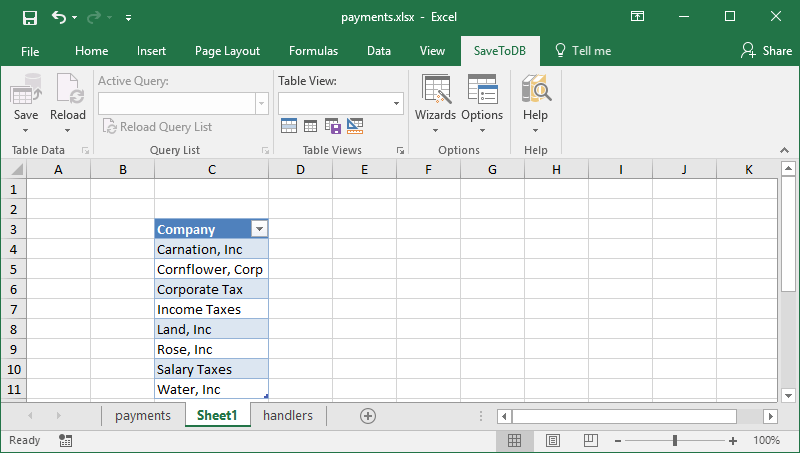 Let&apos;s select the companies sheet and add form fields at cell E4. Then let&apos;s move cell F4, the Company field, to C1 and remove column E. Now cell C1 contains the active company. 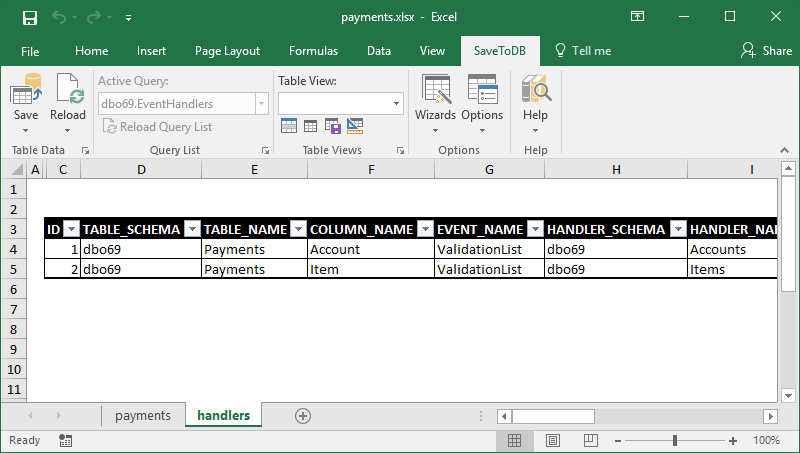 Now, select cell E3 (outside of the active table) and connect to the dbo69.Payments table. 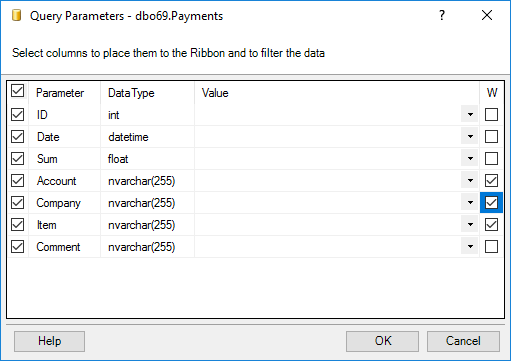 We see that the dbo69.Payments table has ribbon parameters including Company. Also, we see the selected company in cell C1 that may be used as a parameter. Let&apos;s link them. The add-in updates form fields (cell C1 with Company). The add-in changes parameters of the detail tables using named cell values (cell C1 as Company). 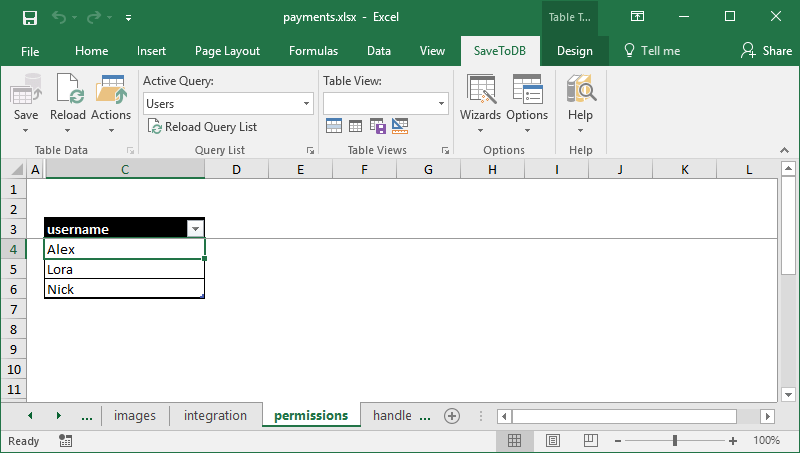 Switch to the payments worksheet and click Reload, Reload Data and Configuration to reload the configuration. You may select another row. The window will stay on top and show related information. 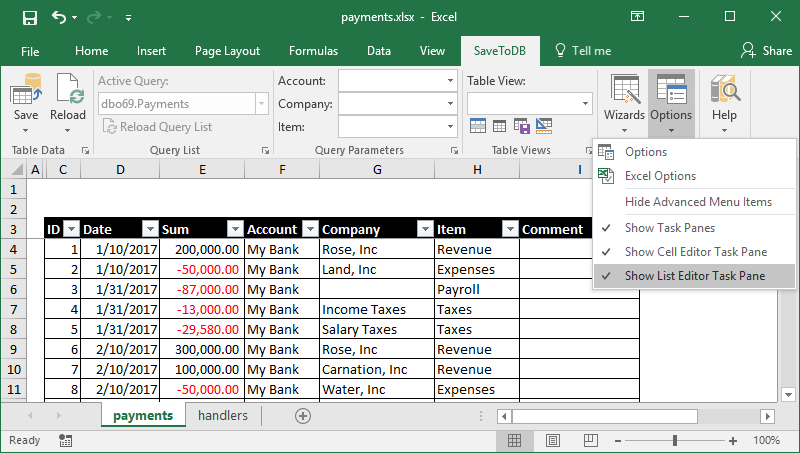 You may customize column formats using the context menu. Also, you may dock task panes and turn them on/off using the SaveToDB, Options, Show Task Panes option. 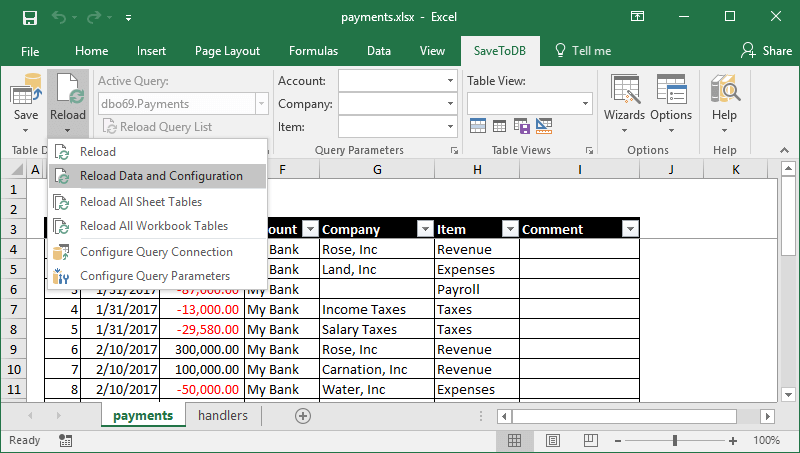 Contrary to the SelectionChange handler, we have specified columns. So, context menus are shown for columns. Also, we have directly specified select columns in the HANDLER_CODE. The plus sign defines the sort order. 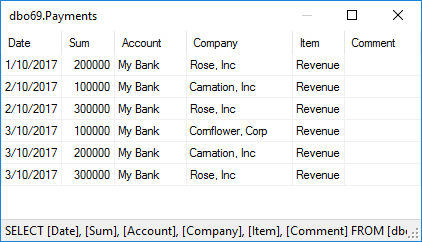 @Company and @Item fields are used in the WHERE clause to filter output data using current row values. Let&apos;s right click on any Revenue item cell and click on the dbo69.Payments item. We will see item payments. However, the ContextMenu handlers support additional configuration parameters like MENU_ORDER and EDIT_PARAMETERS and allow using much more handler types in the HANDLER_TYPE field. Reload data and configuration. You will see the Actions menu with the Instruction link. The Actions menu is a good place for documentation links and common tasks related to a table, not to a row. You may add URLs and image URLs to your tables. This does not require any configuration. Also, the add-in adds the Open URL context menu if a row contains URLs. In this chapter, we will add columns that show times and user names of the latest updates. This helps team members to understand who and when changed data. You may use the following solution in a friendly environment. Otherwise, you have to use database triggers. 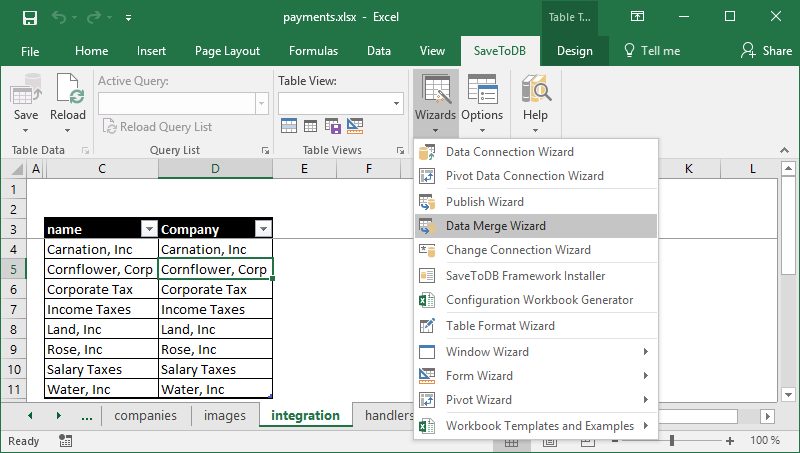 Let&apos;s select the companies worksheet, the Companies table, and launch Publish Wizard. 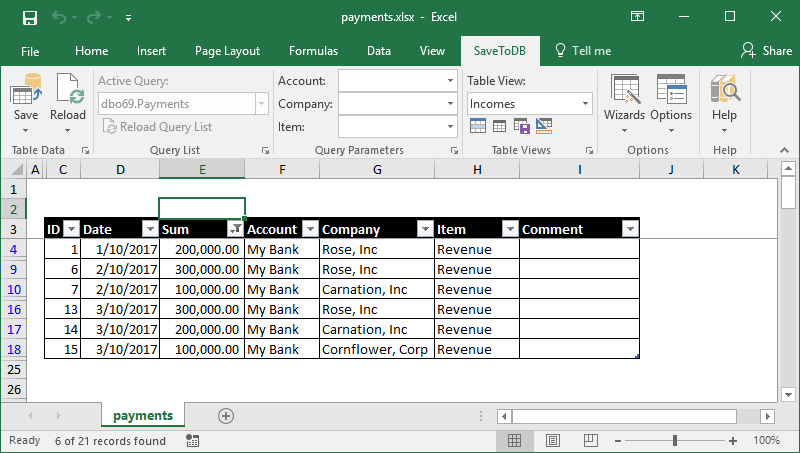 You may change column names and data types in your solutions. 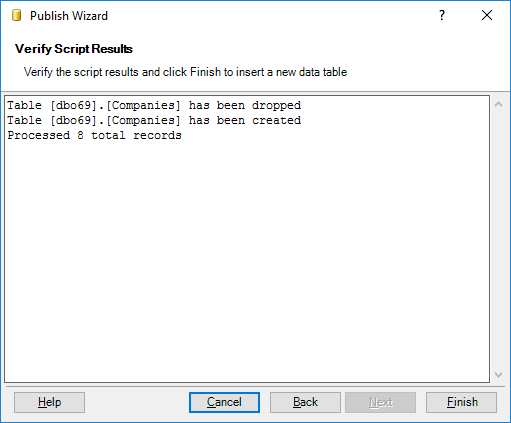 Specify the same table name at the following step and execute the SQL script to recreate the table. 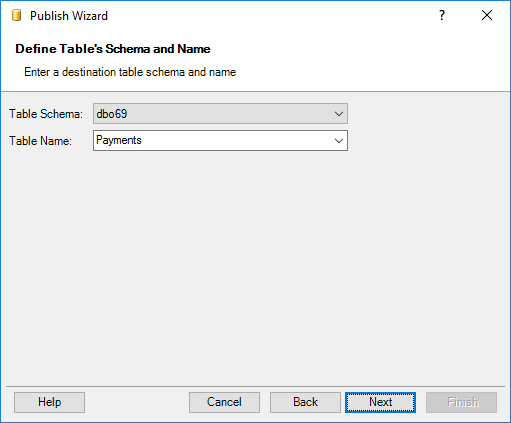 Do not click Finish to skip the creating a new table in the workbook. Click Cancel at this step. The FormulaValue handlers update cell values on row changes using the specified formulas. =NOW() is an Excel formula. You may use this technique for other formulas too. =UserName() is a SaveToDB add-in formula. You may use =DomainUserName() also. The DoNotChange handlers prevent changes in the LastModified and UserName columns. 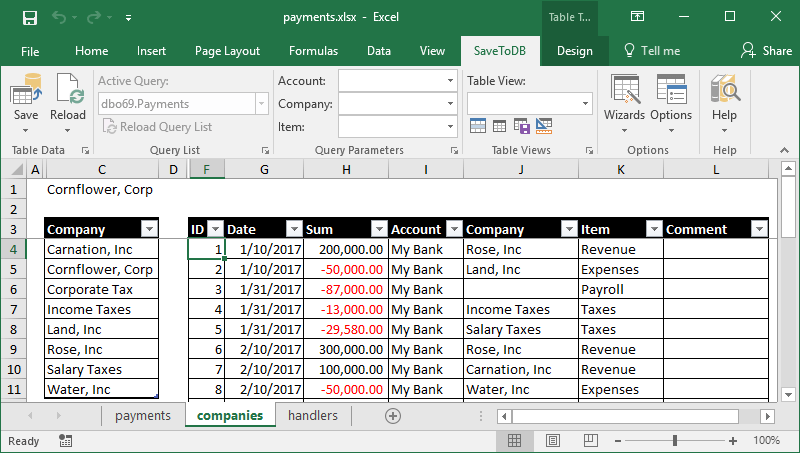 Let&apos;s switch to the companies worksheet and change a couple of cells. As you may see, the add-in updates the values in the LastModified and UserName columns. This technique is very simple. You may add this feature to your tables quickly. However, note that such columns may be updated with any values directly in a database using SQL. 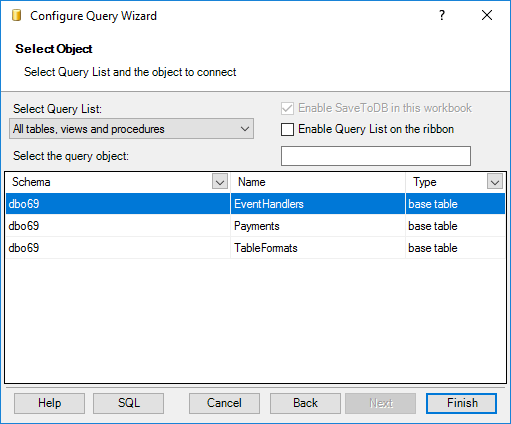 You may load data from external data sources and save the data into your tables. 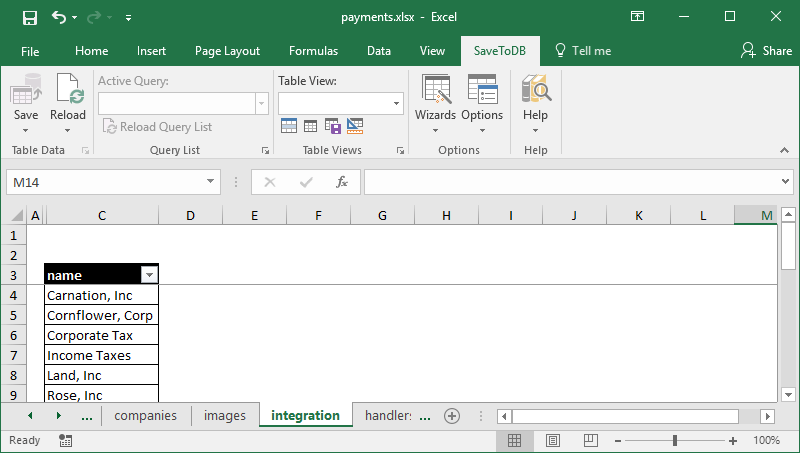 You may load data from databases, web pages, and text files using the add-in, or from other sources using Excel or other tools like PowerQuery. 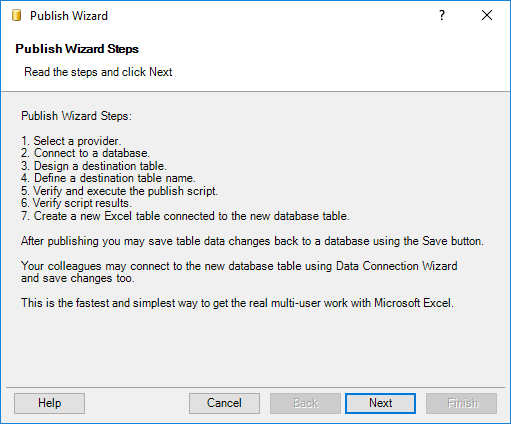 Let&apos;s create a worksheet like integration and run Data Connection Wizard. 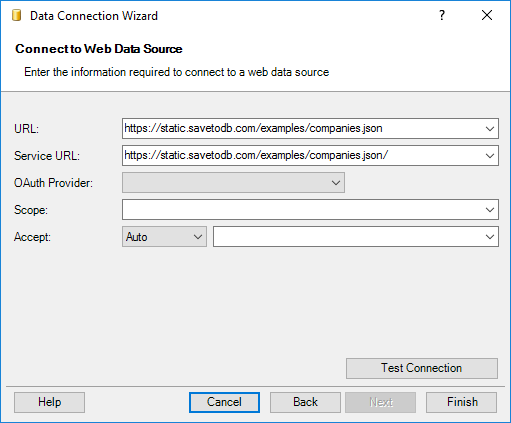 You may connect to any supported data source including text files and web data. Let&apos;s select the Web Data provider. 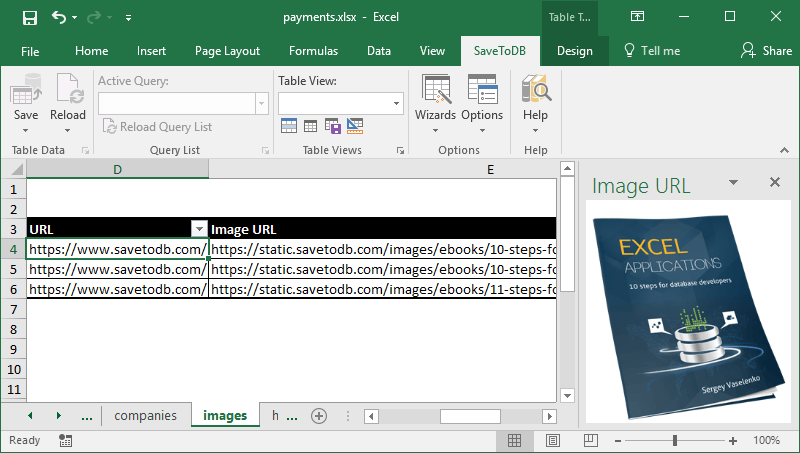 The SaveToDB add-in automatically parses the pages and retrieves the meaningful data. You may also customize the parsers. Refer to the documentation. Let&apos;s insert the new connected table at cell B3. You may refresh the data anytime. The external data source contains the name column. Our dbo69.Companies table contains the Company column. 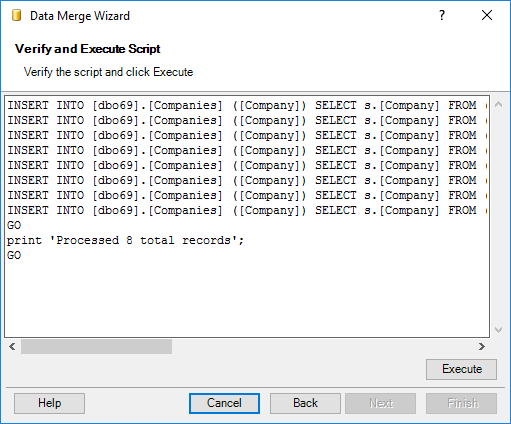 Let&apos;s add the target Company column using the formula like =[@name] and run Data Merge Wizard. 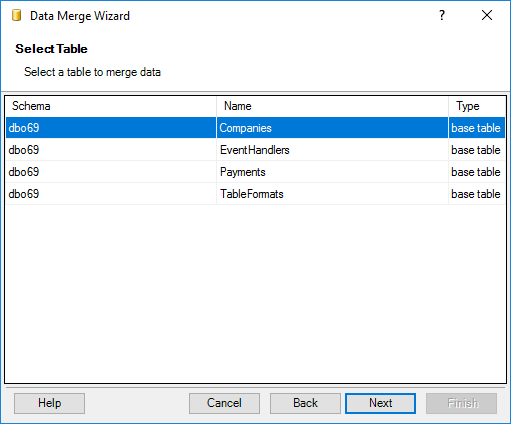 You may see the generated SQL code used to update the underlying table in a merge mode. Click Execute. At this step, you see the execution result. The add-in has updated data. Click Finish to exit the wizard. The add-in saves the merge configuration. 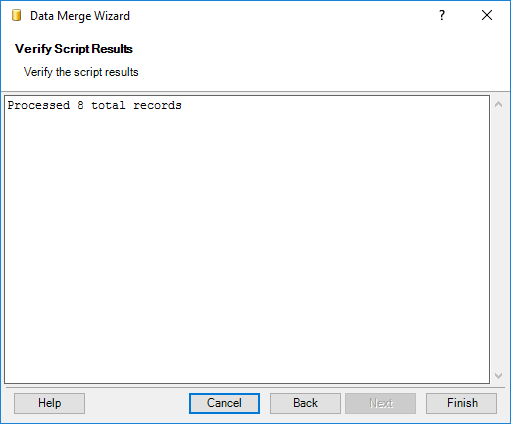 So, later you may use the Save by Merge item to have the same results. Managing permissions is an important part in multi-user environment. Your IT staff manages permissions at the server and database levels. This is their tasks. As a business user, you may manage permissions related to your applications. 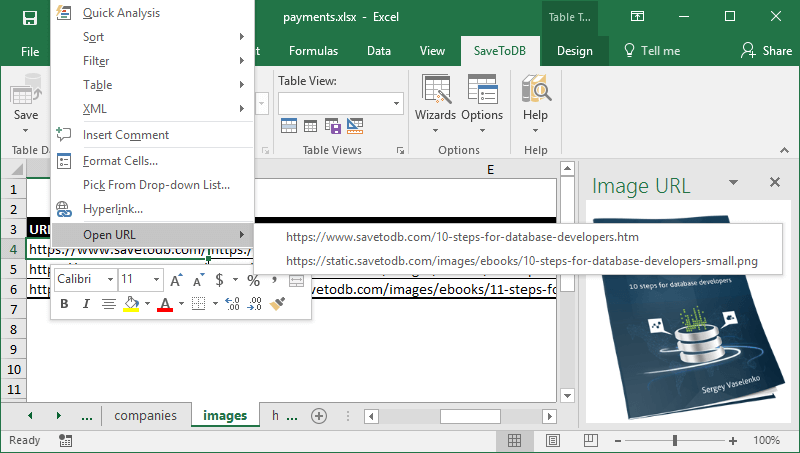 And, the best news, you may do this for SQL Server in Excel using the SaveToDB add-in application. This application is a good example, also, of what you and your developers may do with the SaveToDB add-in. 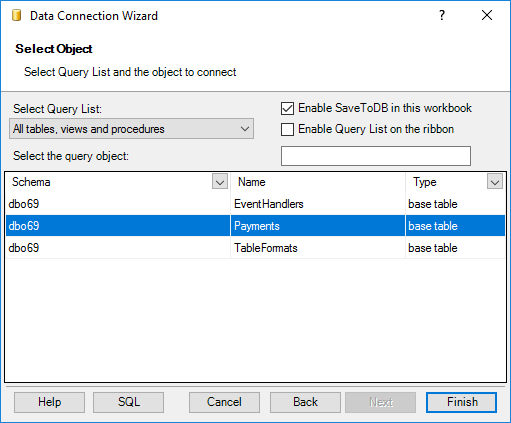 Create the permissions worksheet and run Data Connection Wizard. Connect to your database. 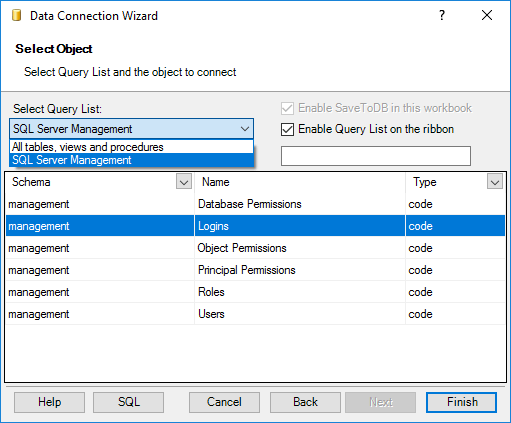 leave Enable Query List on the ribbon checked, and select Logins. Click Finish and insert a new table at cell B3. This table allows managing logins, passwords, and usernames. Just change the data and click Save. Usually, business users see the personal login only and cannot change any value. The Actions menu contains useful actions and helpful links for database administrators. The Users table shows users that you may manage. Usually, business users have no permissions to change. This table allows checking and changing user membership in roles. 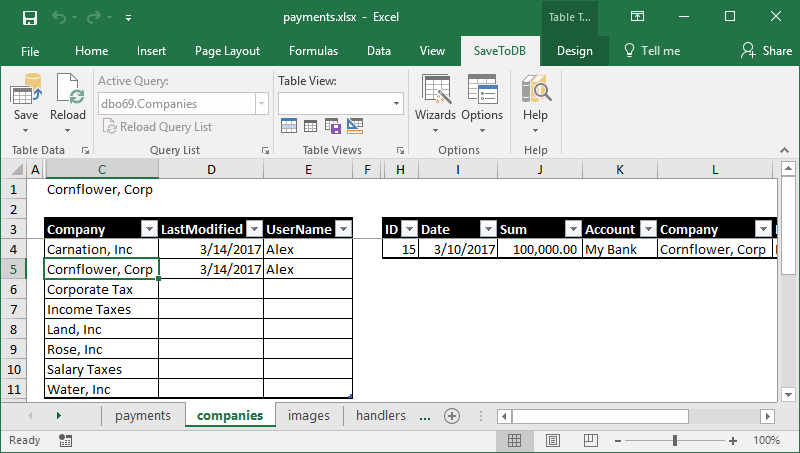 Just set 1 or clear the value in the desired cell. 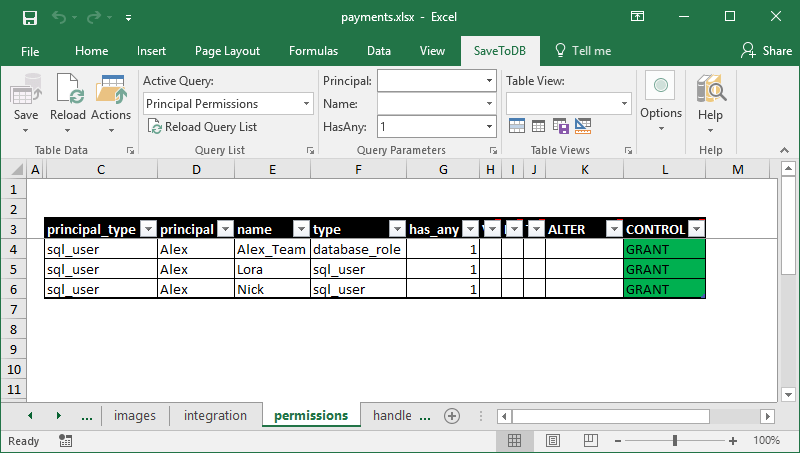 This table allows changing principal permissions. Set the HasAny value to 1 to see the actual permissions only. Only database administrators may change permissions. 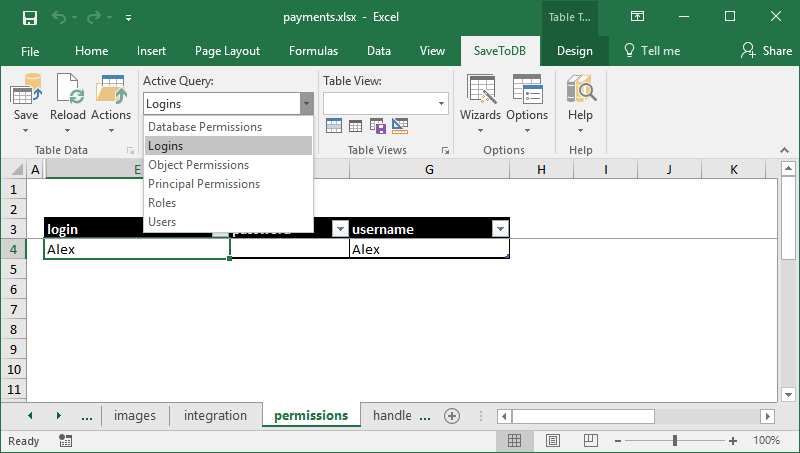 Business users must have CREATE TABLE permissions. This is a working table for business users. We learn it below. Set HasAny to 1 to see the actual permissions only. The database contains the Alex_Team role and users: Alex, Lora, and Nick. 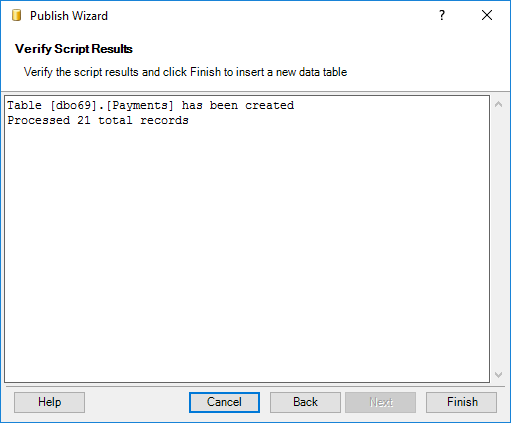 The database contains the dbo69 schema and tables: Companies, EventHandlers, Payments, TableFormats. 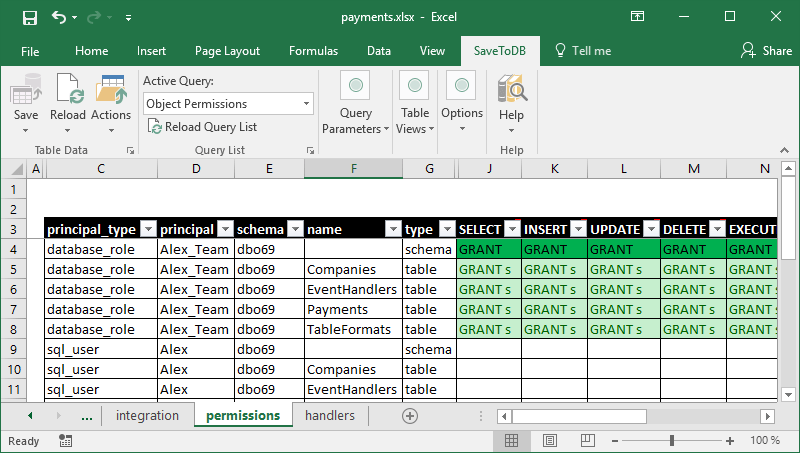 Alex has the CONTROL permission WITH GRANT OPTION on the dbo69 schema and schema tables. 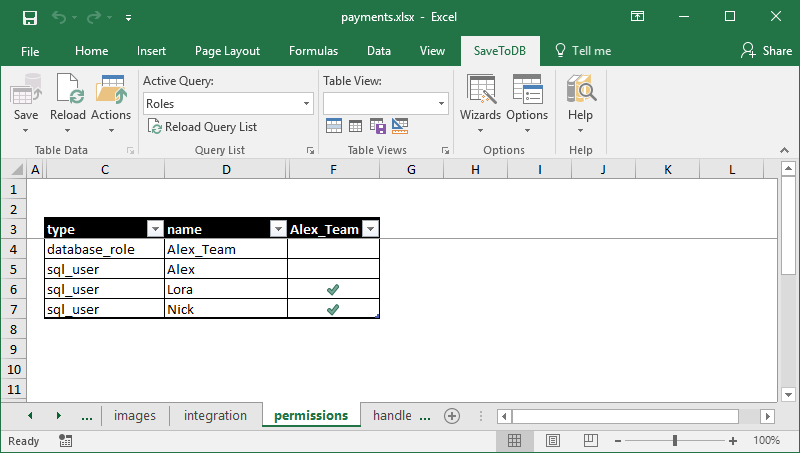 Alex_Team and its members have read and write permissions on the dbo69 schema and schema tables. In the following example, Alex denies the INSERT permission for the EventHandlers table directly, and the UPDATE and DELETE permission indirectly, using the role level. In any case, if you have this task, you will find this app user-friendly and learn required actions quickly. Do not afraid and go ahead. Hope you will like the SaveToDB add-in as I am and will use the SaveToDB tab every day. You may download the SaveToDB add-in at www.savetodb.com and use the SaveToDB Express edition for free. Cool applications for you and your team!